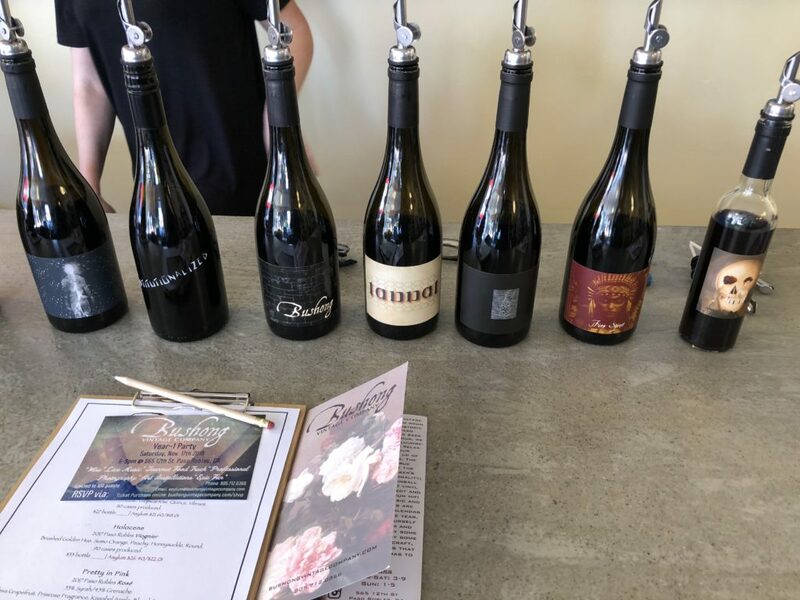 Bushong Vintage Company is another recent wine tasting room we visited. This one is in downtown Paso Robles across the street from Il Cortile Ristorante on 12th Street. The tasting room is a good size with plenty of seating but that’s not the first thing I noticed. Star Wars pinball machine. Yep, and Sammy was with us and got to play it. Nothing like O.G. Star Wars stuff. I also noticed the vinyl. You’ll see in the photos below just how much vinyl. Jason clearly likes his record player. It’s a pretty cool set-up, actually. They’ve managed to turn their tasting room in to a spot where you want to hang out. Fun, funky, and inviting. We tasted a couple of other wines that are not on their regular tasting menu, like their Tannat (which was beautiful). We were really impressed. Jason’s doing a great job with the wines. Annie and I liked each wine quite a bit and look forward to going back. This may be one of my new favorite wineries in Paso. Go check them out and let us know what you think.